BRRRRR! I should not complain, because a lot of places have it a lot worse than us. But our wind chill factor (at least here at the mouth of the gorge where I live) is causing our temperatures to be deceptively chilly, despite the blue skies we had enjoyed last week. There are not many leaves left covering the ground because the wind has blown them all away. But these were caught under a tree and were covered in frozen morning dew, creating a crunchy, crusted cover. They look as though they have been sugared. And such a beautiful crust too. Every place is certainly having strange weather. 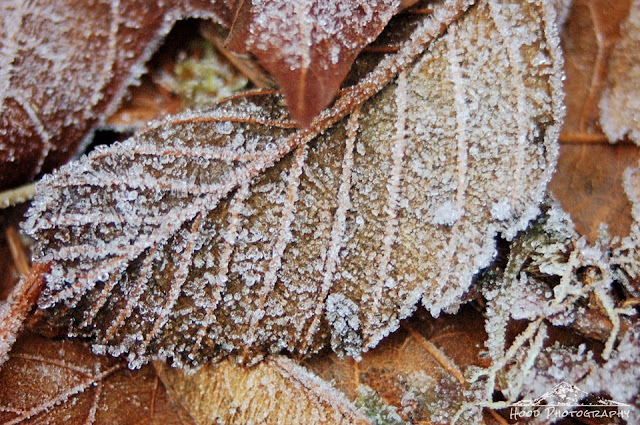 Frosted leaves are so pretty! Very clever photo using crusted. I love how it looks-great job. Looks like sugar coated sweets. This looks so crisp. Nice macro!